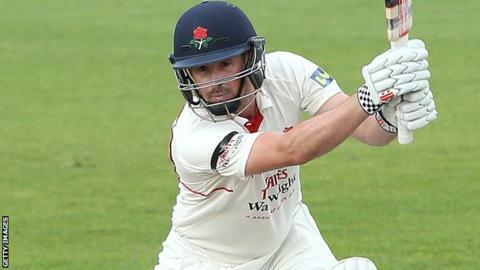 Lancashire beat Kent by nine wickets to claim their second straight County Championship Division Two victory. Resuming on 148-3, 44 behind, Kent's early resistance was led by Sam Northeast (43) and Brendan Nash (27). Quick wickets for Kyle Jarvis (4-67) and Peter Siddle (3-36) then boosted Lancashire, who went on to bowl the visitors out for 295. Set 104 to win in 21 overs, Lancashire won with 14 balls to spare, led by Paul Horton's unbeaten 67 off 62 deliveries. Lancashire, who were relegated from Division One last year, are the only team in Division Two with a 100%-winning record this season, after beating Derbyshire in their first game. Rain interrupted the morning session but Kent slowly edged ahead to ensure the hosts would have to bat again. Northeast and Nash took their partnership to 33 in 16.4 overs before the latter was caught by Ashwell Prince off Jarvis. Two wickets in three balls then changed the complexion of the game, as Jarvis had Sam Billings caught behind for 11 and Northeast played on to Australian Test bowler Siddle. Mitchell Claydon's late cameo of 24, including four boundaries, ensured Kent gave Lancashire a small target to chase. With the light fading at Old Trafford, the hosts only lost the wicket of Luis Reece for 16. Horton and Alviro Petersen (22 not out) then shared an unbroken partnership of 60 to see Lancashire to 107-1. "It was a fantastic win. It was a really hard-fought four days of cricket. "The way we stuck at it, to stick them back in and the bowlers stick at it the way they did - particularly the big seamers - it is all credit to them. "Glen Chapple said it may be a bit close and he was right, it was a bit too close for comfort. The bottom line is we are top of the league. "It is as close to a Test wicket you are going to get. Maybe, to a degree, a bit too good. "But we have to be careful with our bowlers here, we don't want to be bowling them into the ground with the amount of cricket we have in the next 12 weeks." "I suppose we were better today but we weren't good enough over the whole four days. "Credit to them, they bowled well but 30s, 40s and 50s get you in trouble in the end. You have to go on and get a big hundred and we didn't do that. "But I thought they bowled brilliantly, Jarvis in particular."